Since 1960, the Association of Fundraising Professionals (AFP) has inspired global change and supported efforts that generated over $1 trillion. With nearly 30,000 individual and organizational members, AFP raises over $100 billion annually, equivalent to one-third of all charitable giving in North America and millions more around the world. 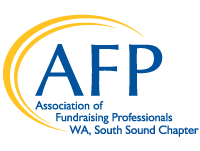 The South Sound Chapter of AFP (AFPSS) was chartered in June 2006 to better serve the educational and networking needs of fundraising professionals living or working in the South Puget Sound region and is an approved provider by the Certified Fund Raising Executive (CFRE). Our membership currently consists of over 100 members with a diverse of skills from a variety of fundraising backgrounds. Our members have a keen interest in continuing education and further developing their skills as fundraising professionals. They also enjoy the many outstanding networking and information-sharing opportunities provided through AFP membership. We welcome you to join us at any of our upcoming meetings and events to learn more. In addition to our website, AFPSS has a monthly e-newsletter and shares invitations to upcoming events via email. Sign up for our e-newsletter to stay in the loop about upcoming programs and announcements. AFP South Sound seeks to advance philanthropy and inspire excellence in the fundraising profession.